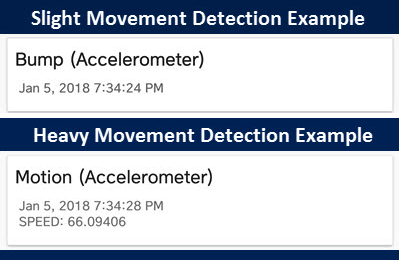 Haven developers have substantially improved the application, just over a week after IPVM's original test report, with Haven now fixing motion detection and crashing issues. 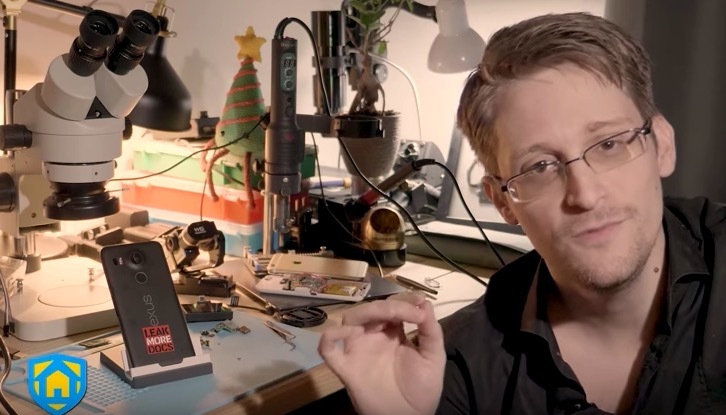 Global coverage followed the December 2017 announcement that Edward Snowden was leading a team developing Haven, an app "that leverages on-device sensors to provide monitoring and protection of physical spaces" (see Snowden's intro video). Haven has the potential to be a low-cost way to provide mobile physical security around one's space and possessions. But how well does it work and who should be using it? IPVM has tested the app as well as reviewed performance and capabilities with the developers. With the improvements Haven has made, our test results find Haven to be useful as a low-cost way to provide personal protection. The largest limitation we still find is that those installing will need to have a moderate amount of technical knowledge which could be a barrier for non-tech/low-tech users. Moreover, the team of developers working on the project (view its GitHub repository and issues being managed) are extremely knowledgeable, dedicated to answering questions and improving the app. As such, we expect continued advancements for the app. In its earlier versions, the app had two key issues in our tests which have been fixed in later betas (discussed below). In its latest builds, on our devices, Haven no longer has issues with crashes or sensitivity (spamming event notifications). Sensitivity issues: Haven sent huge numbers of notifications for video motion detection, even when in a still or totally dark scene. Frequent crashes: The app frequently crashed when performing basic tasks, such as configuring sensors or arming. Additionally, some installation elements are likely challenging for non-technical users (setting up Tor access, configuring Signal alerts, etc.). 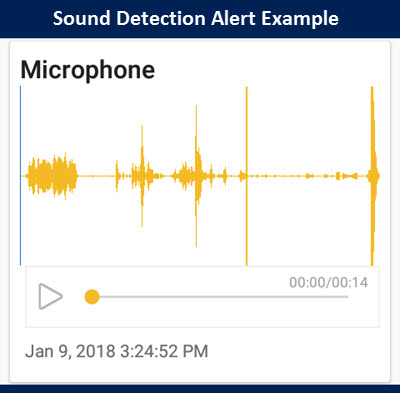 Haven is an Android mobile phone app which allows users to receive alerts based on various sensors on the phone, including video motion, vibration, ambient light, noise, etc. 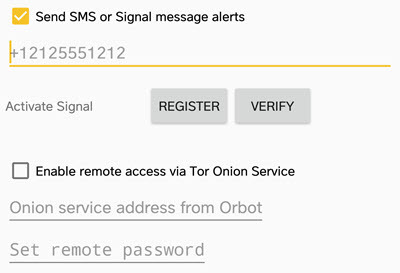 Alerts are sent via SMS/MMS messages or via wifi using the encrypted Signal messenger. 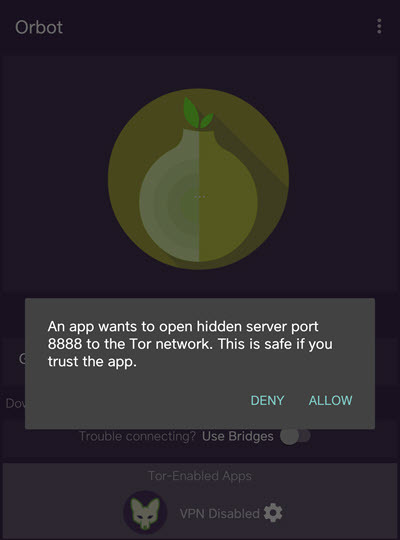 The app does not need to be visible in order to function, and may run in the background or when the phone is locked. Haven is available free on the Android Play store or may be downloaded directly from the developer. Note that Haven does not allow live viewing or listening of audio/video. Only event-based alerts are supported. This rules out its use as a surveillance camera replacement for many users. 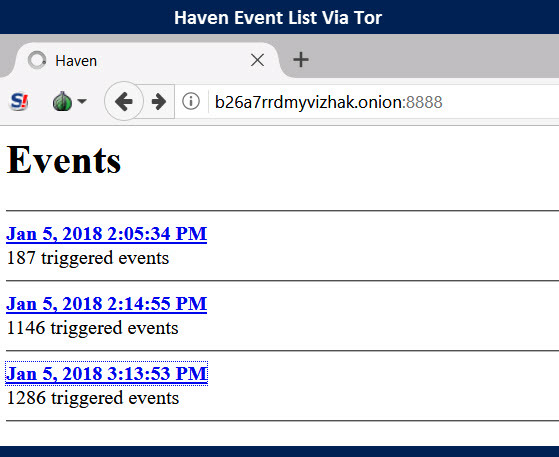 Haven alert history may be viewed remotely using the Tor Browser (an anonymous browser/proxy). Events are simply shown in a list, with screenshots, audio clips, etc. available when clicking a specific event. There is no option to search events. As discussed above, there is no option to view live video or listen to audio from the device via this remote access. 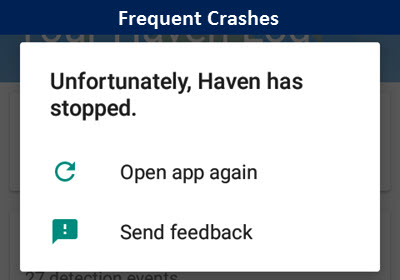 In our original tests of Haven, the app suffered from severe nuisance alert notifications as well as frequent crashes. However, in its latest build (beta 11), neither of these issues are present on our two test devices. Users should be aware they could still be issues on models, as Android phones vary widely in hardware, capabilities, and OS version. 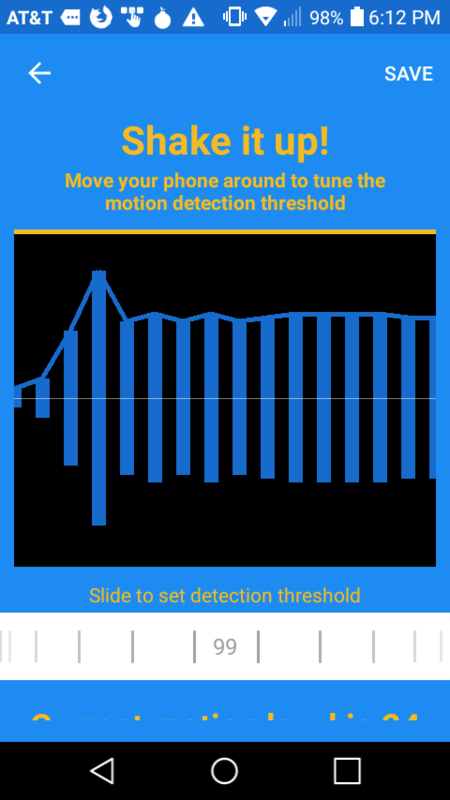 One major issue encountered in our early testing was constant motion alerts on some phone cameras. 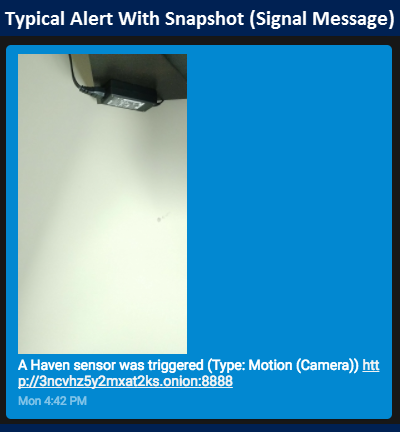 For example, in the clip below, the Haven app sends numerous alerts via Signal over the course of 5 seconds, with no actual motion in the scene. This was common regardless of light level using one phone's rear camera, and both cameras of another model. Even with the phone in a closed drawer, we received ~130 motion notifications in about 4 minutes of testing. Haven's developers say this is due to unexpectedly high sensitivity on some newer model cameras, and they will be making adjustments more granular in upcoming releases. As of now, there is no way disable these alerts. Haven crashed frequently during our original testing. This was common during multiple operations, including when opening the app, activating the camera, or occasionally when large amounts of motion/ambient light change occurred. Note: test was originally released on Jan 16th and re-published, incorporating improvements on Jan 26, 2018. Comments (9) : PRO Members only. Login. or Join.